Michelle has been at the setting since February 2006. She has a BA Hons degree, Early Years Professional (EYP) status and is trained in food hygiene and first-aid. Michelle also teaches socatots within the nursery. 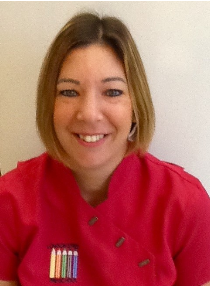 Helen has a BA Hons degree and is also a trained first aider and has a food hygiene certificate. Chris has completed a Level 3 certificate in Early Years and Development and has a first aid and food hygiene certificate. Cath has her Level 3 and has completed her first aid training. Zoe came to us on placement whilst she was studying towards her Level 3 qualification in Early Childcare and Development. She was so good that we didnt want to lose her when she completed her course. Jillian has her level 3 qualification and is also first aid trained. Due to increasing numbers we have recently recruited Emily. She joins the team with years of experience and also holds a first aid certificate.